Great capture, I love the expression on the grandfathers face, well done. Oh, I love this shot! 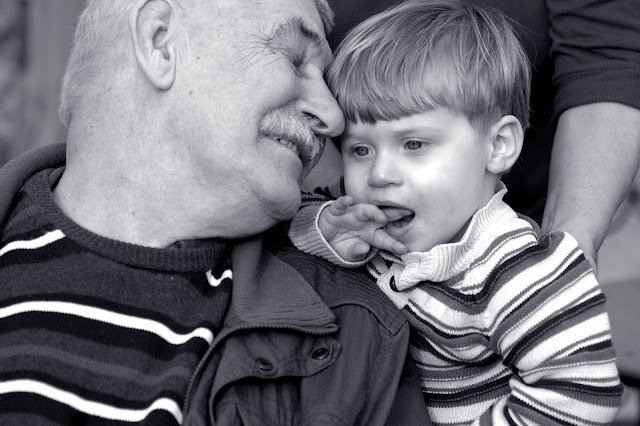 Grandparents and grandchildren have a special connection, don't they? You can totally see the love in this picture. What a special moment, the black and white makes it so classic! Hope you've all recovered from the sickies! Love this picture, Great Grand totally in love while the little guy looks so peaceful and secure in that love. Awww-this is really sweet! Nice capture! I love how proudly Poppy is looking at his grandson! Your photo captures that bond perfectly, and I love the black and white for this photo. Love this shot. This is the kind of picture that will last for generations. Awesome! Wow... what a beautiful moment captured! So sweet! That is such an amazing photo. Your Poppy's expression is priceless. Joy. I love it. I'm following you because your pictures make me smile...and who couldn't use a smile to start the day?